You know what it’s like: it’s a special occasion and you want to impress someone by taking them out to a swanky place. I had foolishly tried to go to Ichi Ni Izakaya on the St Kilda Esplanade one very rainy day in Melbourne, only to be turned away. Myself and dining companion had to be in the area for a gig across the road at the Palais, and so I took it upon myself to treat dining companion to some Japanese bar nibblies beforehand as it was his birthday, and this time, I booked. After an arduous tram commute across Melbourne, I arrived late and found my partner pleasantly sozzled. In my absence, he had ordered edamame (steamed salted baby soy beans). He also told me about how after asking whether yukke was available, he experienced disgust as well as ignorance from the waitress asked. This quite shocked me. To forget this shaky start, we ordered the very expensive Kinsachi Nagoya Akamiso. Delicious malty goodness this may be, but not sure it’s worth $16.50 a bottle. I hadn’t tried it before and wasn’t sure what its availability was so suggested we have it. Enough whining from me, you want to see the dishes chosen, don’t you? 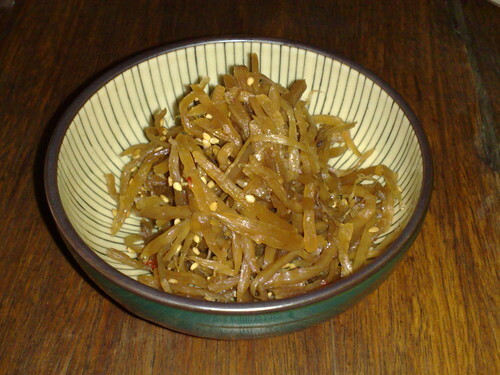 Bring on kinpiri (sauteed, simmered burdock root). Imagine the texture of a seaweed salad, but with a sweeter taste. I know it’s freaking everywhere, but the pork belly was calling. I’m used to seeing it in nice, thick pieces with velvety melt-in-your-mouth fat. 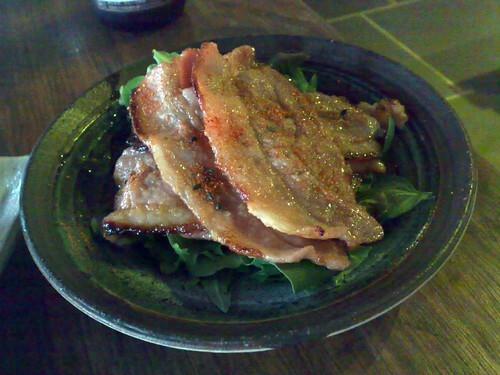 At Ichi Ni, it is sliced thinly and looks like…bacon! 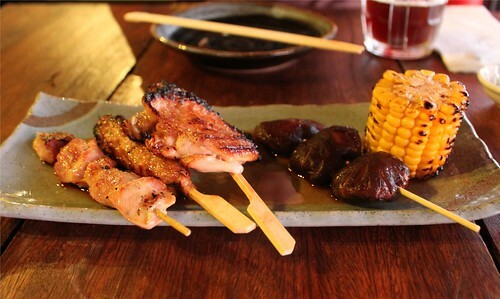 The yakitori set sounded pretty cool and featured an array of both vegetable and meat items. The tori (chicken) is a bog-standard item, the tsukune (chicken meatball) were okay, The tebasake (grilled chicken wing) might be a Nagoya specialty, but on a skewer I found it frustratingly difficult to eat – it’s really hard to get the meat off the bones. Shittake mushrooms were wonderfully marinated and I could easily have several of those on skewers. A trio of kaki might have to cleanse us of our meat-eating guilt. 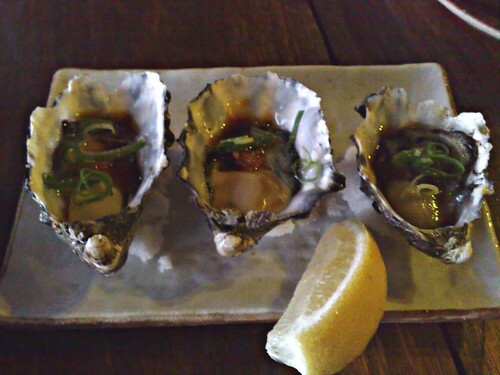 Oysters are always moreish. 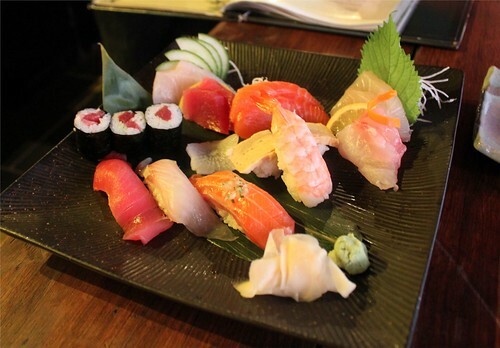 For mains, a sushi and sashimi mixed platter was shared. I asked the waiter if he could recommend a sake to go with it, and that I wanted a cold, dry one. I wasn’t impressed at all with his inability to assist me. After much dithering, he handed me the menu again and told me to choose one myself. Surely there was at least one member of staff who was intimate with the large sake selection on offer? Still, I wasn’t leaving without dessert. Two were ordered – the chocolate harumaki, with ice cream and a honey almond sauce, and the quartet of ice cream scoops with unorthodox flavours – edamame, balsamic vinegar, cheese cake and pumpkin. The balsamic vinegar one was really strange, but a very cool concept. While I had no trouble getting the bill, paying was another matter altogether. The glacial front of house seemed very preoccupied in sorting out a party whose booking they could not find and didn’t seem interested in assisting me at all. By this stage, I’d pretty much lost my patience. More disconcerting for them, it would have been very easy to walk out without settling the account. Ichi Ni might be very stylish and possess enough demand that you can’t just walk in and expect to be fed, not to mention only being able to dine for two hour sittings, but I do not find this attractive enough to ever warrant revisiting. They can’t get simple things like good, attentive service right, and the morsels on offer are not astonishing. Perhaps the establishment feels its attitude is part of their charm? My opinion aside, the birthday celebrant loved it. 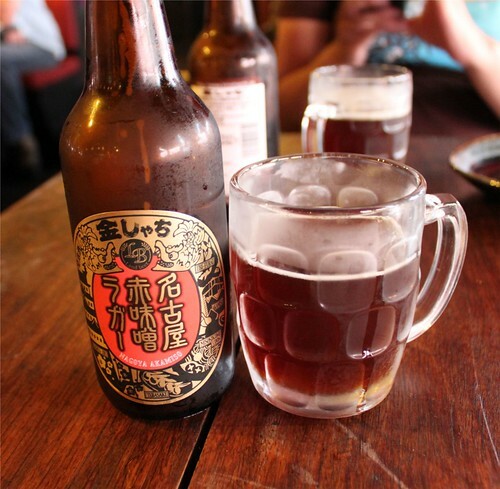 It is indeed a good thing that Melbourne has plenty of other izakaya to check out as I don’t intend to return here. 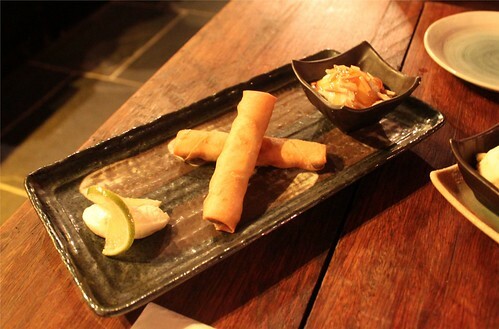 This entry was posted in eatie-foodies dining out and tagged bar snacks, Ichi Ni Izakaya, izakaya, Japanese food, Melbourne, St Kilda on April 15, 2010 by gem. Horrified you asked for raw food, or something Korean? @eatnik the former, I believe. It is available at other izakaya in Melb but probably best to ask @tristankenney as I’m going on two sets of anecdotal evidence. I must confess I assumed yukke was one of those ramen-tanmen deals – that is the Japanese and Korean have their own version of what is nearly the same thing. @jetsettingjoyce I’d only ever go back if a friend was having a birthday thing there, but that’d be for *them* as supposed to go back for the Ichi Ni ‘experience’. 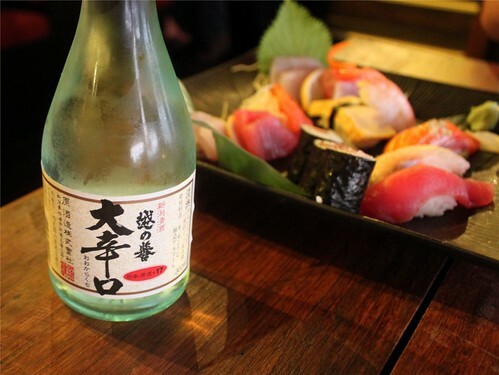 Like I said, I’m just glad Melbourne has more izakaya and I look forward to checking those out. How strange to serve up pork belly in such a fashion? The meat to crackling ratio doesn’t seem favourable to the dinner at all. 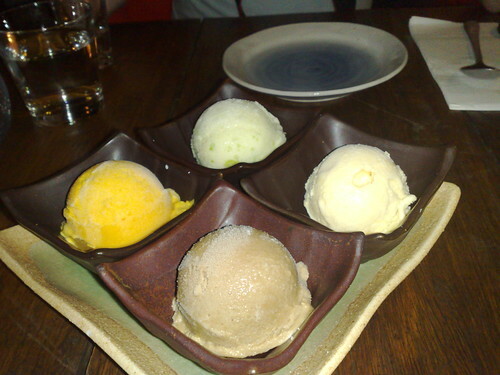 Do not like.Meanwhile, the ice cream quartet looks mighty delish. @rperdio ’tis fancy bacon! Well, no I’m sure it’s not, but it looks awfully like it! As for crackling? Darling, there was none, alas. Oh well. Good thing I love my pork, hehe.Yeah, the ice cream quartet was pretty cool – innovative flavours and beautifully presented. Let me know if you ever go as I’d be keen to see if your thoughts mirror mine. I know our opinions differ when it comes to bars – you might like it more than I did?